Elihu Vedder (1836 - 1923) was an American symbolist painter, book illustrator, and poet, born in New York City. He is best known for his fifty-five illustrations for Edward FitzGerald's translation of The Rubaiyat of Omar Khayyam (deluxe edition, published by Houghton Mifflin). 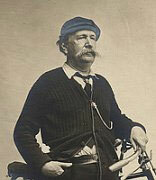 Elihu Vedder was born February 26, 1836 in New York City, the son of Dr. Elihu Vedder Sr. and Elizabeth Vedder. His parents were cousins. His father, a dentist, decided to try his luck in Cuba and this had a profound impact on Elihu Jr.'s childhood. The remainder of his childhood was spent between his maternal grandfather Alexander Vedder's house in Schenectady and a boarding school. His mother supported his goals to be an artist while his father reluctantly assented, convinced that his son should try a different occupation. His brother, Dr. Alexander Madison Vedder, was a Navy surgeon who witnessed the transformation of Japan into a modern culture while he was stationed there.